SusieQTpies Cafe: Tiny Prints Christmas Cards are top notch! Time to order my Tiny Prints Christmas cards! I am a huge fan of all their cards. I always thought that they were just an online company but a few weeks ago I received their catalog in the mail. I was really happy to get that because I passed it along to a friend who isn't tech savvy like myself. I am going to order some of these Berry Wonderful cards in cranberry for the older folks on our list. They love getting our photo cards every year and this is one that they can hang on their little tree. I don't know about you, but I save all the photos that I get each Christmas season and we keep them up all year long. This Berry Wonderful card would be a great way to send a card and allow the receiver to keep it hanging up all year long, unlike a regular sized greeting Christmas card. I was also looking for a different Christmas greeting card for the folks who I know do not have a tree or wouldn't care to have my kids photos hanging up all year. I love this Sprigs of Joy card! Individual photos shots and then one big family shot in the middle! Perfect.This way they can see my kids and file it away with their other Christmas cards! I do love how you can personalize your cards with Tiny Prints. It is super easy to do and the quality is always top-notch! I love their products and I blog about them at least 2-4 times a year. With my Christmas order this year, I'm also ordering thank you cards to be sent after the holidays are over. This way I will have them on hand and as we receive gifts we can get the thank you note written. I'm going to try and be organized this year. How about you? Do you order any type of holiday cards? If so what do you order? Do you include photos? Tiny Prints provides simple, modern, and unique stationery from Christmas cards, New Years cards, party invitations, andaddress labels to thank you cards. Once the holidays have come and gone, Tiny Prints will still be here to fill your stationary needs with their exclusive designs from the nation’s top designers. All year round, you’ll fine business cards,birth announcements and even custom wedding invitations. Come try the easy card personalization, a powerful preview engine and top-notch customer service and paper quality for yourself. 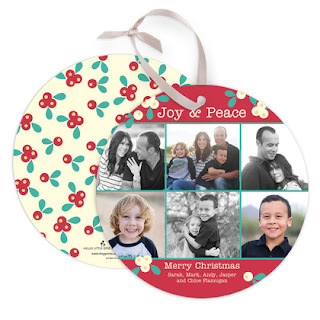 With Tiny Prints by your side commemorating every holiday and momentous occasion is a cinch! I am writing this sponsored post thanks to my work with Global Influence. I am participating in the Tiny Prints blog program. I am a customer of Tiny Prints and my own tasty opinions are expressed here.